The likely U.S.-led coalition air strikes against Syrian President Bashar al-Assad’s forces in response to the latest chemical weapons (CWs) attack should be crushing. If I had to bet, Americans will overwhelmingly support them. Yes, Americans, including many President Trump supporters, are skeptical of U.S. foreign interventions. Americans feel burned by the George W. Bush administration’s invasion of Iraq (where are the WMDs? ), the chaos that ensued after Saddam Hussein’s demise, and the long, protracted war that continues even after President Obama’s untimely withdrawal. We forced the Iraqis to adopt democracy, and that hasn’t panned out so well. The continued instability there also allowed ISIS to fester. But Syria in 2018 is not Iraq in 2003 and a response to Assad’s CWs is not deposing Hussein. A longer-term strategy for dealing with Syria, likely heavily relying on cooperation with Arab partners and avoiding an increased ground presence, is sorely needed. But those who say we need to figure that out before responding to the CW attack are wrong. The president and his national security team can handle the immediate problem first. There is no doubt about the weapons Assad has and his willingness to employ them. The last time Trump ordered a strike against Assad in response to Assad employing CWs, 57 percent of Americans supported that decision, including a whopping 84 percent of Republicans. As of October of 2017, nearly half of Republicans polled supported the United States launching a preemptive strike against North Korea. Preemptive. It is a misreading of Trump voters to conclude that a significant portion categorially oppose U.S. military intervention. What they oppose is fighting long wars in the form of a series of tactical half-measures while hamstringing our military, which incurs massive costs on Americans without a discernable positive outcome. They are sick and tired of losing precious lives and expending treasure for unclear or impossible causes under the leadership of indecisive politicians. The United States will not be chasing rainbows and forcing democracy upon the sectarian mess that was once the nation of Syria. One of the most consistent themes from the Trump foreign policy team has been its disinterest in foisting democracy on undemocratic people. Trump has also proven he can be decisive on big decisions—for example, his willingness to accept the offer to meet with Kim Jong Un on the spot. The military’s mission for these airstrikes should have three goals. One, to inflict enough pain on Assad that it causes him to regret his decision to employ chemical weapons. If the response is not so punishing that Assad thinks the chemical weapons were worth the cost, he will try to do it again. The result will be that Assad will normalize CWs as a category of weapons. Two, severely hamper Assad’s ability to carry out another attack by crushing the facilities that produce the CWs and their means of delivery. Three—and this will happen if the first two happen—communicate to Assad’s enablers Russia, North Korea, and Iran, who also happen to be U.S. adversaries, that while we want peace, certain behaviors will elicit a military response from the world’s superpower and our closest allies. One of those behaviors is the use of chemical weapons. Chemical weapons fall into a separate category of weapons. The 1925 Geneva Protocol following World War I banned them. (Decades later, the Chemical Weapons Convention improved upon the protocol.) Some weapons that caused far greater loss of human life and possessed much greater destructive abilities were not banned. Chemical weapons were banned essentially because they are used solely to cause agonizing pain and suffering. Chemical weapons are indiscriminate, the winds can carry them across unsuspecting cities, and the people most vulnerable are children and the elderly. They are terror weapons. Assad wanted to force the Syrian rebels out of their stronghold in Douma, but after weeks of battle, the rebels would not relent. So Assad authorized the use of chemical weapons against the rebels’ families. To be clear: Assad made the decision to intentionally, slowly torture infants, children, and their mothers in order to cause the surviving fathers to submit to his rule. It is evil. The day after these attacks, the rebels took a deal with the Russians that included the rebels leaving the city. Assad’s tactic worked. If Assad continues to employ them with impunity, the United States and the rest of the world are permitting him to normalize them. Recent U.N. reports show that North Korea has been helping Syria build an industrial-scale chemical weapons production facility. Considering the heightened tensions between the United States and North Korea, and the forthcoming talks surrounding North Korea’s nuclear weapons program, it would make a whole lot of sense for Trump to do a show-and-tell of the fruitlessness of investing in these kinds of capabilities, either at home, or abroad. If that does not happen, and chemical weapons are permitted to be produced, employed, and transported in Syria and throughout the region, this would most immediately greatly endanger Israel. 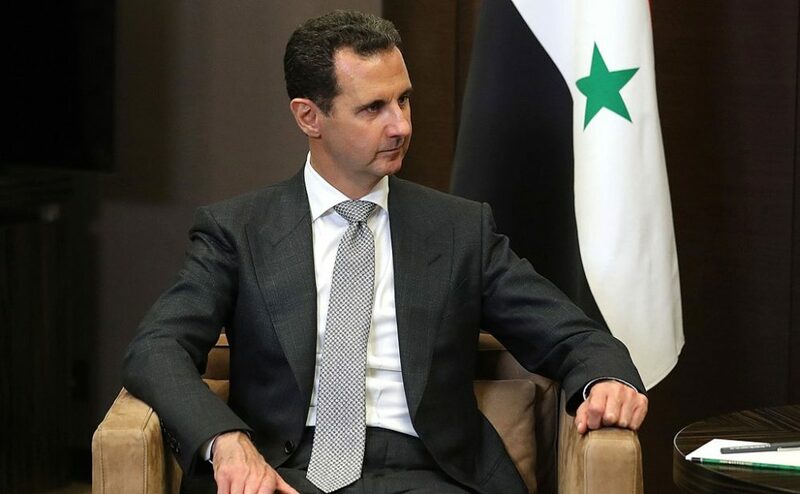 Unless Iran is stopped, with Russia it will finally establish Assad’s Syria as its proxy state. Then Iran and Syria can more easily transport those terror weapons, along with all the other weapons they possess, closer to Israel’s border. It would be foolish to bet that a regime willing to enable Syrian toddlers and their mothers to writhe, foam, go blind, and suffocate after agonizingly fighting for their lives, would not be willing to do the same to the Jewish state and its allies. The Israelis have already launched initial strikes, possibly to make sure they take out targets that the Syrians might otherwise try to hide in anticipation of American strikes. The Israelis have proven once again that they won’t sit and wait until those chemical weapons are at their doorstep, and they won’t stand by and watch them tried out on little Syrian children, either. Americans, the French, and Brits disagree on much today and many of our interests conflict, but on this, on a fundamental point of morality, human dignity, and self-preservation, we should demonstrate that we are still far more alike than different. It certainly seems like the Russians, Iranians, North Koreans, and Assad are about to see what it looks like when they provoke us.